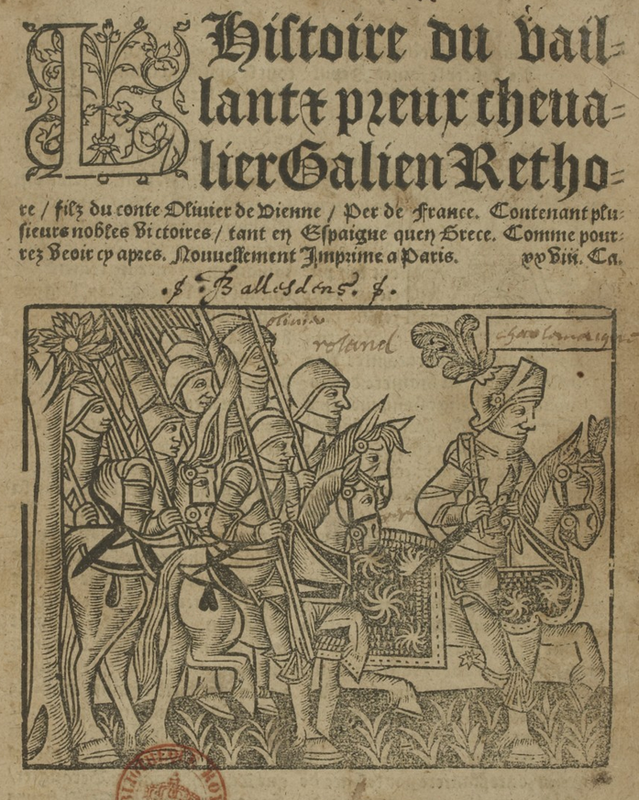 L’hystoire de preux & vaillant Chevalier Galien Rethore filz au conte Olivier de Vienne per de France. Paris: Jehan Bonfons, . Provenance: Joseph-Antoine Crozat. — Crozat sale, Paris, 1751, lot 2017. — Jean-Louis, Baron d’Heiss. — d’Heiss sale, Paris, 22 July 1782. — Richard Heber. — Heber sale, part IX, Sotheby, 11 April 1836, lot 1274. — G. Gancia Rare Books, Brighton. — Morris. — Richard Bennett. — Sotheby 1898, lot 462 (sold to Heppenstal for £10 10s.). — Maurice Henry Hewlett. — Maurice Desgeorge. — Silvain S. Brunschwig. — Brunschwig sale, Geneva, 28 March 1955, lot 413. — Morgan Library (198075) [purchased from Konstantinopel Rare Books, September 2018]. Reference: Ellis valuation, fol. 19b, no. 259a (£12).